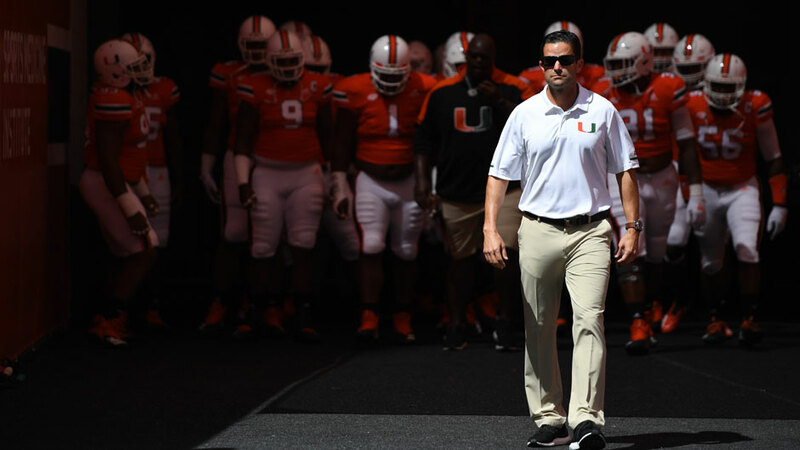 Manny Diaz, a sports lover at heart since childhood, takes the reins as head coach of the Miami Hurricanes football team. Elisa Diaz had prepared one of her grandson’s favorite breakfast meals and placed the dish on the dining room table, urging the young boy to eat while the food was still hot. But 7-year-old Manny, clutching the sports section of the Miami Herald’s morning edition, had other plans: the results and box scores from yesterday’s late-starting games would take precedence over pancakes. It was a routine Elisa was quite familiar with. The Cuban grandmother would cook Manny’s breakfast everyday, only to watch him read the sports page at length as his food sat on the table. “He’s always loved sports,” she recalls. Today, Manuel Alberto (Manny) Diaz II is a 44-year-old man with a wife and three sons. His grandmother no longer cooks his breakfast, only an occasional pot of his favorite meal—red bean stew. But what hasn’t changed is his love of sports. It is a passion that persisted throughout his years as a student at Miami Country Day High School, where he competed in football, basketball and baseball, and as an assistant coach at collegiate football programs across the nation. Now, that passion is as powerful as ever as Diaz takes the head coaching reins of the Miami Hurricanes’ storied football program. Meet the team behind the team, employees and student volunteers who make every game day such a huge win for the University. He grew up cheering for the Hurricanes, attending UM games at the Orange Bowl in Little Havana with his father, former Miami Mayor Manuel “Manny” Diaz, a UM School of Law alumnus who left Cuba in 1961 with Elisa, his mother. “You went to the Orange Bowl on Saturday and watched the ’Canes, then you watched [quarterback] Dan Marino and the Dolphins on Sunday,” recalls the younger Diaz. He was just 9 years old when UM defeated a powerful Nebraska team 31-30 in the Orange Bowl on Jan. 2, 1984, to win its first national championship, and the press conference where he was introduced as Miami’s 25th head football coach fell exactly 35 years later to the day that Miami won that title. “For the 9-year-old kid who was up past his bedtime watching Kenny Calhoun bat that ball down, and watch the ’Canes storm the field—the fact that I’m here, standing in front of you now as head coach of the University of Miami—if you need more evidence that this is a ‘God’ story, then that’s it,” said Diaz. The Hurricanes faithful, who have yearned for a sixth national championship ever since Miami won its last some 18 years ago, are hoping Diaz will help write more Miami football history. He’s actually already done so. Two seasons ago, he came up with the idea of the Turnover Chain to inspire his defense. And it worked. UM defenders recovered 14 fumbles and intercepted 17 passes in 2017 for 31 turnovers in all, tied for third most nationally. The Cuban link chain, draped around the neck of any Miami player who intercepted a pass or recovered a fumble, quickly captured the imagination of college fans everywhere, even inspiring rival programs to come up with their own turnover prop. That Diaz-led defensive unit helped catapult Miami to a 10-win season, an Atlantic Coast Conference Coastal Division title, and a berth in the Orange Bowl. Diaz took a different route to the coaching profession. After high school—he was a two-way player on Miami Country Day’s small football team, playing left tackle on offense and cornerback on defense—he wanted to remain close to football. He knew it just wouldn’t be as a player. So he studied sports journalism at Florida State. “She was the one who said, ‘Let’s go do this. Let’s follow this dream,’ ” said Diaz. So, along with his wife, he returned to Tallahassee, where Chuck Amato, the then-defensive coordinator at FSU, helped him get a part-time job stuffing envelopes in the school’s recruiting office. Though the work was humble, it helped kindle a coaching career that would see Diaz follow Amato to North Carolina State as a graduate assistant and then full-time linebackers coach. Defensive coordinator jobs at Middle Tennessee State (2006-2009), Mississippi State (2010 and 2015), Texas (2011-2013), and Louisiana Tech (2014) would follow before Diaz landed with former head coach Mark Richt at UM in 2016. Just before the 2018 season had ended, Diaz accepted the head-coaching job at Temple University but still coached Miami’s defense in its bowl game against Wisconsin two days after Christmas. When he awoke on the morning of Dec. 30, 2018, Diaz busied himself by identifying potential assistants he could hire to lead his staff at Temple. Then, later that day, came the news that jolted not only him and the ’Canes community of players and fans, but the rest of the college football world as well: Richt, who had restored the Miami program to relevance, going 26-13 in a three-year stint, announced his retirement. A whirlwind series of events would follow, and before day’s end, Diaz was named Miami’s new head coach. He was staying put, having never really left. He has his work cut out for him at UM. The Hurricanes open the 2019 season against the Florida Gators at the Camping World Kickoff game in Orlando, and there’s also a road game in Tallahassee against the Seminoles. Diaz has already invigorated the fan base, promising to improve quarterback play at Miami. And he’s bolstered the team’s roster, mining talent from the transfer portal. He and his coaching staff intend to institute offensive and defensive schemes that give players the best chance to succeed.